Skin brushing or dry body brushing is an easy, inexpensive, and effective method for everyone to improve their appearance and help maintain a healthy body. A dry brush exfoliation treatment helps give the skin a healthy radiance by boosting circulation and invigorating the system. Try this self-help method to improve your skin's look and feel by improving tone and helping to achieve an overall smoother, tighter texture and many other anti aging benefits. This simple routine has also been known to be a great prep before applying self-tanner. The value of this century old practice and the anti-aging benefits it offers is regaining its popularity today. This invigorating treatment not only makes you feel energized it also helps improve immune function by encouraging new cells to regenerate and rid the body of toxins. Keeping the system clean of toxins and purified will help strengthen the immune system. It also has lymphatic drainage benefits. By stimulating blood and lymph flow it will keep nutrients moving and help carry away waste, aiding in kidney function. Some have found the stimulation is also been known to be beneficial for the prevention of varicose veins, and the breakdown of fatty deposits, reducing cellulite tissue. Treatments are always done on dry skin to achieve the best results. Start with a firm, natural bristle dry brush. 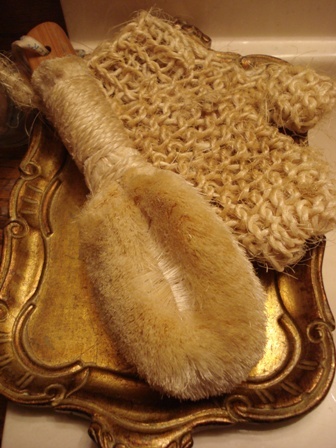 There are various types of natural fiber body brushes that are widely available. This brush should be kept dry and not used for bathing. This pleasurable easy treatment will quickly become an addicting way to start your day- easily fitting into one’s beauty or grooming regimen just prior to your bath or shower. This method is an invigorating exfoliation that promotes circulation and it will leave your skin smooth and silky. Vary the pressure to your comfort or requirement. Pay particular attention to thin and sensitive areas, cellulite-prone areas, and rough areas such as elbows and knees. Begin by brushing the sole of your foot from the toes to the heel with firm strokes several times. Brush the top of your foot up towards your ankle. Continue brushing up the entire surface of your leg towards the heart with long,sweeping strokes, making sure you cover both front and back. Brush with circular motions across the knee front and back. Brush the front of the thighs right up to the groin (major lymph node) and back of the upper leg up to the buttock. Repeat the same for the opposite leg. Gently brush your abdomen from navel to outer abdomen in circular, clockwise motions several times. Brush your buttock area upwards over your hips, to your waist. Continue to brush up the whole back to the neck and shoulders. Repeat the whole procedure on the opposite arm. Gently brush from the neck down across the décolleté. Follow up with a warm shower or bath. Apply a moisturizer after bathing to moist skin. Experience Skin Brushing - Easy, Inexpensive and Anti aging!